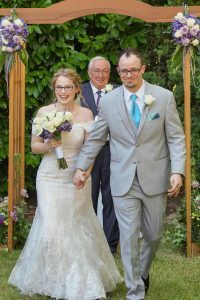 I had the opportunity recently to be interviewed by Wedding Venture and I thought I’d share it with you. 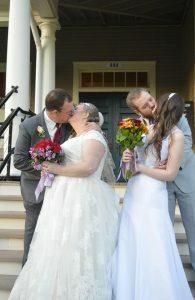 Peak season 2019 is already booking up fast so don’t delay in contacting me to talk about your officiant needs, wants, and desires. Click on the graphic to see the whole interview. 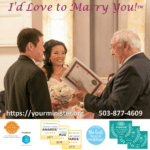 Book before the end of 2018 to get 2018 prices for your 2019 wedding officiant needs! 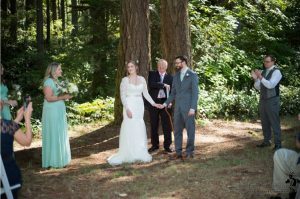 Due to increased costs, I’m raising my fees for my wedding officiant services, which haven’t changed since early 2017, effective the first of 2019. But if you get engaged and book your wedding before the end of 2018, I’ll honor the 2018 prices for your 2019 wedding. Check Jon’s Booking Calendar on the homepage to see if your date is available. Even if you see a red (booked) or yellow (reserved) color on your date, please give me a call at 503-877-4609 or an email because I may still be able to accommodate your needs. I can often do two weddings in a day if they are spaced far enough apart time-wise and not too far apart location-wise. Here’s a short video summary and here’s a longer video for you to watch. Or just click below. Here’s a great new place to find the wedding professionals you need to make your special day as perfect as possible! It’s called RingedUp. 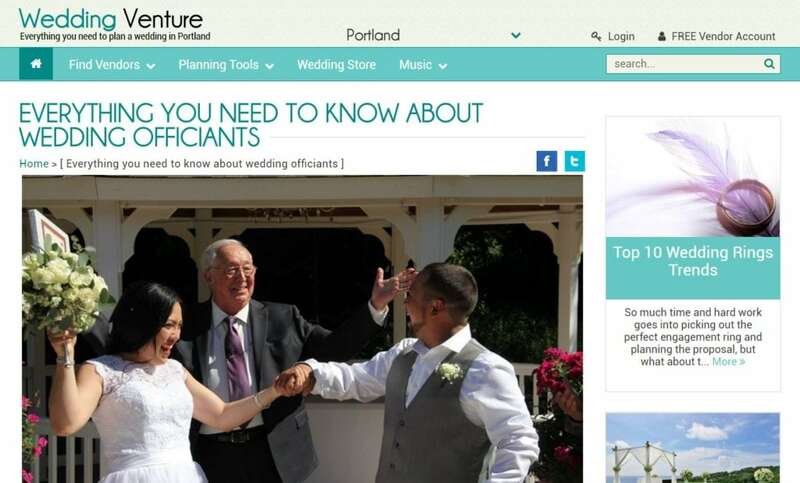 Now, in addition to — or even instead of — searching huge directories of wedding professionals on the large national wedding websites you can hone in on just those Pacific Northwest-based services that you need. Launched just this month, RingedUp — as in newly engaged! — has 100+ members already. 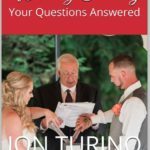 You can find my listing on the new website at https://www.ringedup.com/listing/wedding-officiant-jon-turino/. More categories will continue to be added as time goes by, so do search the new website for your wedding needs! I’d Love to Marry You in 2018! You choose the venue that suits you and your fiance the best. Then you book me to develop the script and vows that suit you two the best. 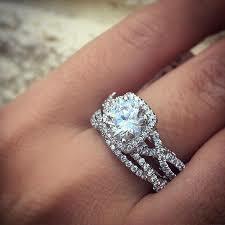 Then I marry you with a ceremony that meets all of your needs, wants, and desires. What more could you ask for to make your wedding day as perfect as possible? Check Jon’s Booking Calendar or give me a call at 503-877-4609 to check my availability for your desired date and venue. And Now, It’s Time To Wed. HELP! Are you scared yet? Let me ease your fears. Planning your wedding is a daunting task. No question about it and I don’t intend to trivialize your trepidations. Guest list first. Your one most controllable expense factor. Wedding date. Winter, Spring, Summer, or Fall? Fees for almost everything are typically higher during the peak season — May through September in the Portland/Vancouver region. And Saturdays always get booked first by venues and vendors of all types. So now to go to work on a venue. Indoors or out? Or outdoors with an indoor backup? Important! Catering might be next — supplied by the venue as part of a package or do you want to bring in your own food (or have an independent caterer take care of that)? What about the cake (or cupcakes or other dessert options)? What about bartending needs if you plan to offer adult beverages at the reception? Music? For the ceremony and the reception? A DJ, a live musician or group, or a playlist on your smartphone? Can your venue handle your choice? Oh! And, by the way, you’ll need a professional officiant to perform your actual wedding ceremony! Leaving that detail to the last minute could leave you in the lurch! And that’s where I come in. I’d love to marry you and your fiance. Let’s have an up-front conversation about what your processional will look like. How many bridesmaids and groomsmen? Flower girl(s) and ring bearer? Grandparents, parents, and ushers? Who gives this bride? Religious or non-religious ceremony? Special readings, songs, or remembrances? Special ethnic, cultural, or other ceremony elements (like unity candle, sand, handfasting, rushnicks, or others)? This part can be the least stressful and simplest part of your wedding planning tasks because I take full care of it for you. 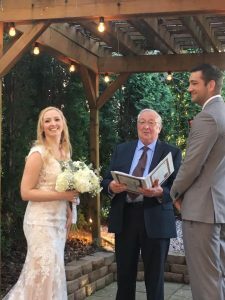 I’ll send you a draft script and vows to which we can make any changes that you’d like so that the ceremony meets all of your needs, wants, and desires. So you’ll know exactly what to expect on your wedding day. I’ll “spoon feed” you the vows and the ring exchange words so that you’ll have nothing to memorize or remember. 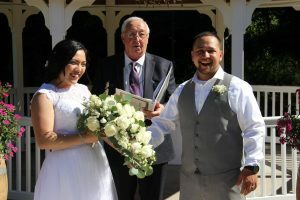 You’ll simply be able to enjoy your ceremony as we share it with your guests! 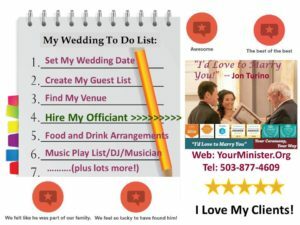 Check out the reviews and the photos of the 150+ weddings I’ve been privileged to perform over the last few years and give me a call or an email to see if I’m available on your desired date. I normally do only one wedding per day so that I can make sure that you have the best experience possible. 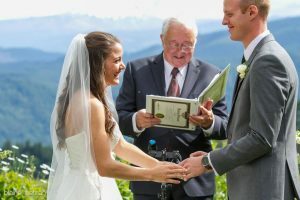 Many couples make the mistake of leaving their officiant selection to the last minute. I urge you not to do that to yourselves! Let’s give you a ceremony that you’ll love! 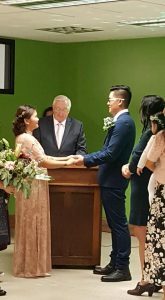 My sincere thanks to all of you couples who provided me with the privilege of officiating at your wedding in 2017! If you haven’t written your reviews yet, I understand. Between honeymoon travel, thank you notes, name change activities, etc., these things can fall into a crack or seem unimportant to you. 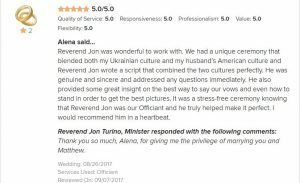 On the other hand, were the reviews important to you when you selected me to be your officiant? My guess is that your answer is yes, so please help future couples by providing those reviews now. It’s never too late! 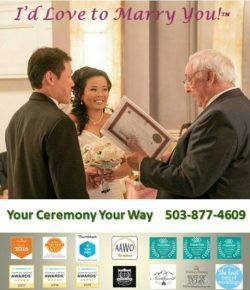 I did my first ceremony for Lily and Chong in August of 2015 at the Sentinel Hotel in downtown Portland and I owe a real debt of gratitude to Lily for getting me into my true calling as a wedding officiant. I did a dozen or so weddings in 2015, more than 40 in 2016, and more than 85 in 2017. I’ve loved doing every one of them. And the clients I have served. And 2018 looks like it will be well over the 100+ mark. 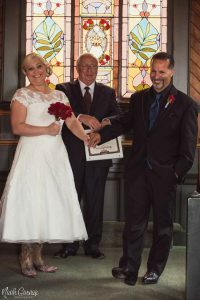 If you need an officiant I’d love to marry you and your fiance, so please check Jon’s Booking Calendar for your desired date and get your retainer in as soon as you’ve selected your date and venue. I’ll work with you to create a ceremony and vows that meet all of your needs, wants, and desires. It’s now engagement season. I’ve already booked a half-dozen 2018 weddings from the Thanksgiving holiday and I expect that there’ll be many more through Christmas, New Year’s Eve, and then Valentines Day. Congratulations in advance if you get engaged during these times and I hope you’ll contact me on my website or by phone or email, or via one of the many other sites where I am listed so that I can make your special day as perfect as possible. In the meantime, I wish you a Merry Christmas, Happy Holidays, and a Happy and Prosperous New Year in 2018. I look forward to speaking with you and to marrying you! Here are a smattering of photos and review. There are many more on my website.